Sweet little fights, always teasing each other and true love & care for one another , this is how is the relationship of brother & sister. Raksha Bandhan or Rakhi( in short) is a special occasion celebrated on this unique & cute relationship. On this day, Sister tie Rakhi on her Brother's hand & pray to God to keep him from away from all problems & evils. Brother in turn promises to protect the sister from all troubles & harms. Last year I had shared one DIY Rakhi with you guys. This year again I got requests from many people to make another DIY Rakhi. However because of the last min requests, this time I have prepared quick 5-10 min Rakhi. I am sure your brother will be surprised with a handmade Rakhi like this. You guys liked my Choker Series & because of the very good response on that series I will be sharing the Rakhi also in the series format starting from today. And I know Rakhi has already come & you guys will be busy in preparations thats why I am making sure that all Rakhi in this series will not take more than 10 minutes. 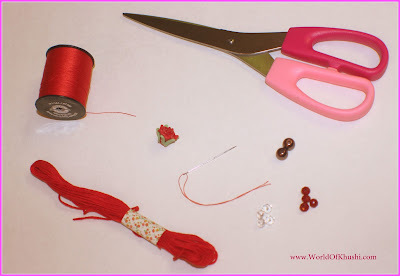 So lets begin & start making the first Rakhi of this series. Here we are going to make Rakhi in two different phases to understand the process easily. First we will create the center of Rakhi & then both the sides of it. In this part we are creating the Center Portion. Step 1. Take normal Red Thread. Insert the thread in the Needle & tie a knot at one end. Leave little extra thread at the end so that we can tie with the Silk thread in the later step. Step 2. Start inserting beads! Put a Crystal Bead, then Red one, then Pearl, then again Red one & again Crystal one. Step 3. Now in the middle add Red Rose Flower Bead. Step 4. Again after flower bead, add Crystal Bead, then Red one, then Pearl, then again Red one & again Crystal one. Same with we did on the left side. Step 5. Tie a knot again on the other end leaving extra little thread remaining as we did in step1. Your Center Portion is ready. If you face any problem just refer the image. In this part lets assemble everything. Step 1. Take 2-2 strings of red Silk Threads. Cut them in two equal sizes ( for both the laces of Rakhi) according to your desired hand size. Step 2. Just tie the silk thread with the other normal thread (which we left in both the sides of the middle part). You can also use three strings instead of two & make a three strand braid. I am using with 2 strings only. 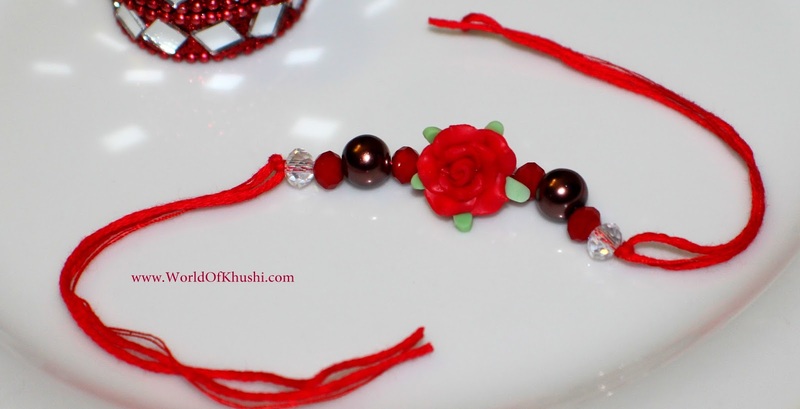 Your beautiful DIY Beads Rakhi is ready. Refer the pictures whenever you are in doubt. Bring in your creativity & you can customize the Rakhi according to your choices. It seems complicated reading this but trust me once you start following the process step by step it is not. I hope you like this DIY!! You can put your imagination & creativity as much as you can. Do try this at home & share your creations with #KhushiWorld. Your comments & feedback is always valuable. Enjoy your day & celebrate the festival with lots of fun. For more such DIYs stay tuned with Khushi's World. Also like and share this post with your friends and family. Follow me on Khushi's World Facebook Page, Google+ , Instagram and Pinterest for more Posts. I will see you in next post till then take care.